Evan Mallett is the owner and chef at the Ondine oyster and wine bar in Belfast. The view of Belfast from the Ondine oyster and wine bar. On a recent busy afternoon at Ondine Oyster + Wine Bar in Belfast, head chef and owner Evan Mallett brought a box of long, reddish-purple and white baby Japanese turnips out from the kitchen to show his staff. “Look at these. Aren’t they beautiful? They’re amazing,” said Mallett, marveling at the turnips’ bright colors and attractively slender form; they were harvested from Fine Line Farm in Searsmont, not too far from Ondine’s downtown Belfast location. 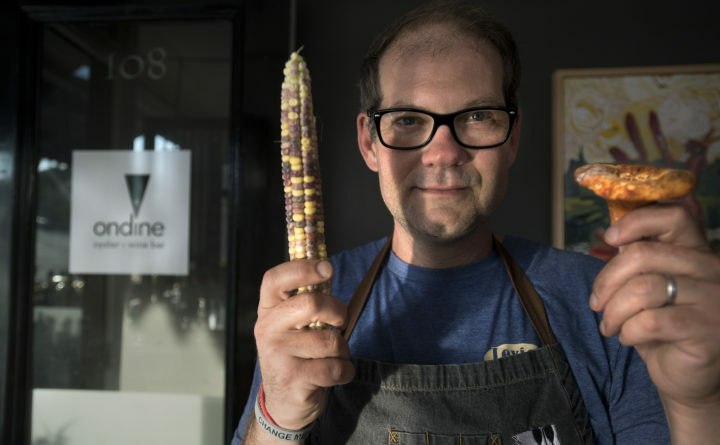 Mallett, who opened his Belfast restaurant in late July, has made a name for himself in New England food circles as a passionate lover of all things local. The seafood, the meat, the produce, the foraged mushrooms, everything at Ondine: if it’s possible to source it locally, Mallett will. Mallett, 49, is best known for his other restaurant, Black Trumpet in Portsmouth, New Hampshire, which he co-owns with his wife, Denise. Since 2007, Black Trumpet has offered globally-inspired cuisine that puts local food from New Hampshire’s Seacoast region front and center. But midcoast Maine, a hotbed for Maine’s contemporary farming renaissance, has long been on Mallet’s mind as a dream location for a second restaurant. After first visiting the region about seven years ago, Mallett’s been smitten ever since. Years went by, however, before a good opportunity presented itself to make that idea happen. When the restaurant space at 108 Main St. — formerly home to Arata and The Gothic Restaurant, and before that, the original incarnation of Erin French’s The Lost Kitchen — became available, the dream became reality. Mallett got his start as a chef in the 1990s, cooking in Washington D.C. and in his native Boston for years before opening Black Trumpet. That restaurant was an expression of what he is most fully invested in, as a chef: the ingredients. Many of the recipes developed at Black Trumpet can be found in Mallett’s cookbook, “Black Trumpet: A Chef’s Journey Through Eight New England Seasons,” published in 2016. Black Trumpet also reflected his devotion to New England’s terroir — the unique environmental factors that influence what is grown on the land. In Belfast, Mallett has brought the locavore ethic from Black Trumpet, but has given it a different spin — it’s a slightly more casual place, with a busy bar and ordering options for small, tasting menu sizes, and larger plates for a longer, more luxurious dining experience. With a name like Ondine — named for a mythological water elemental, like a mermaid or naiad — one would expect there to be lots of seafood on the menu. There’s an ever-changing oyster menu of shellfish sourced from Maine’s many oyster farms, to be paired with things like fried almonds and house-made pickles. On a recent weeknight, other seafood dishes included a fish fry comprised of crab croquettes, oysters and fish; hardshell clams served with polenta, greens and smoky bacon in a pork broth; and a half lobster served with either brown butter and lemon, or herb aioli, Mexican street corn and a popover. Beyond seafood, however, there’s another section of the menu dedicated solely to swine. There’s charcuterie both house-made and sourced from Morse’s in Waldoboro, served with an array of sides, and pork from Dogpatch Farm in Washington, available in a multitude of forms, from crispy pork belly to confit shoulder. The cocktail menu is colorful and inviting, all priced at $13, with unique, garden-inspired concoctions like the Bee Balm Bounce (tequila, lime and house-made bee balm tincture), the Shiso Maniac (gin, sake, melon puree, lemon, agave nectar and herbaceous, citrus-y shiso leaves) and Puestra de Sol (cava sparkling wine, the aromatic Cocchi Rosa liqueur, lemon and thyme bitters). An extensive wine and beer list rounds out the menu. 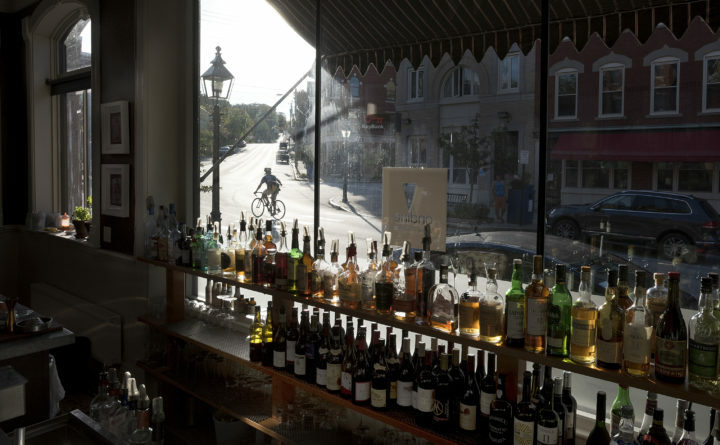 Now that Ondine has been open for a few months, Mallett has had a chance to think about things beyond the kitchen. Namely, his work with the Heirloom Harvest Project, a nonprofit based in New Hampshire that seeks to assist farmers with growing endangered heirloom varieties of various plants, and then sharing those seeds with other farmers. While many Midcoast farmers are already sharing seeds with one another, Mallett and his organization hope to expand into Maine, and hopefully connect those heirloom growers with restaurants and other buyers. Ondine Oyster + Wine Bar is open for dinner from Thursdays through Tuesdays, 5 to 9 p.m. It is closed on Wednesdays. For more information, like them on Facebook.